When I first became a project manager, it did not take long to realize the pain associated with a lack of resource availability and cross-functional cooperation. This includes a lack of direct project support from functional areas and having the project work low on their priority lists. There simply had to be a better way for the teams to succeed. A few years later, I became a PMP (project management professional) and then grew into the manger of project management role. As manager of multiple project managers, it made sense to me to attempt to apply project management best practices across all tech transfer projects. After all, I thought, why reinvent the wheel? I made it my goal to apply the PMBOK(Project Management Body of Knowledge) best practices. Initially it seemed daunting, but I gradually realized I only needed to apply those principles which truly added value to project teams which manage the technical transfer process. For those unfamiliar with the PMBOK, there are five process groups: initiating, planning, executing, monitoring and controlling, and closing. Also, there are 10 knowledge areas, project management of: integration, scope, time, cost, quality, human resources, communication, risk, procurement, and stakeholders. The resulting project management guidelines are organized according to knowledge areas and contain only those items which best facilitate tech transfer projects. For example, there is a scope document, a timeline, a communications plan, and a risk assessment plan. A scope document lists all deliverables and their associated activities and is organized according to functional areas. The project management office (PMO) is responsible for training team members from all of the functional areas on their responsibilities according to the project management guidelines. One point to make perfectly clear is that organizational project management guidelines will not work if the organization, from the top, does not endorse and support them. Assigning a project manager to a project, in and of itself, without guidelines, provides no assurance that a project will be successful. My organization at the time fully endorsed and supported the guidelines because they provided a level of assurance that tech transfer projects would be successful, a strategic goal of the organization. After all, a PMO, by definition, defines and maintains project management standards within the organization in order to facilitate organizational objectives. Pharma organizations are organized into functional areas (i.e., manufacturing, validation, engineering, quality, regulatory, purchasing), as specialized dedication and expertise are required in each area. The guidelines need to provide project responsibilities and expectations for each functional area. Functional areas, like the organization as a whole, have reporting structure including directors, managers, supervisors, and specialists. The assignment of human resources to projects and resulting cross-functional cooperation are necessary for successful CMO project management. A major CMO objective is to successfully carry out tech transfer projects for their clients. Each functional area has a responsibility within that objective. This requires that functional areas provide resources to project teams to carry out their specialized project goals. The assigned team members are, subsequently, held accountable for project performance by their functional area management. The guidelines provide specific responsibilities for each functional area. For example, engineering will spec a tank, provide drawings for approval, and perform factory acceptance testing and installation qualification, operational qualification, and performance qualification (IQ/OQ/PQ). Purchasing will ensure the components, excipients, etc. are available per the timeline. Validation will ensure all of their deliverables and associated documents are prepared and executed per the timeline. 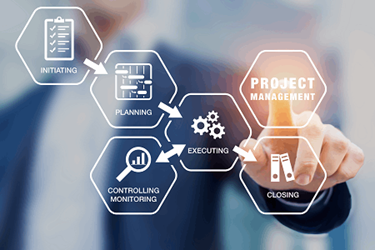 When a new project is identified, the project manager contacts each pertinent functional area manager with a preliminary scope of work for that area and requests that resources be assigned to the project. Managers assign resources based on individual workloads and capabilities. The responsibilities of the various functional area team representatives are outlined in the guidelines. The project manager reviews the responsibilities at the beginning of each project and holds the team members accountable to the deliverables and agreed-upon timeline. General team member responsibilities include attending team meetings, providing action item updates, keeping functional area management informed, and advising of any potential timeline delays. The project becomes part of the assigned team members’ annual performance reviews. Thus, functional area objectives are directly tied to organizational objectives. The project manager continuously keeps the project scope in check and gains buy-in from management if the scope changes. If a resource is not available or if workload exceeds capabilities, the issue can be escalated. The project manager must take responsibility for managing cross-functional cooperation. This includes strong communication with each team member about expectations and scope, but also includes communication with the management team to assure continued success for the team members, and, ultimately, the team. Gaps in support are escalated by the project manager and by the team member if the scope changes without controls in place. The timeline created by the project manager contributes to an understanding of cross-functional cooperation in that it is organized according to functional areas and shows the interdependencies among functional areas. Regularly scheduled organizational management project review with managers and directors includes discussions on individual performance issues, functional area workloads, and resource availability. In this way, project goals support organizational goals and functional area goals. William Allen is a pharmaceutical industry professional with 20 years of parenteral CMO experience. He has managed aseptic manufacturing operations and multiple technical transfer and manufacturing scale-up and compliance projects, gaining and applying expertise in project/program management of start-to-finish parenteral manufacturing. William has managed multiple cross-functional project teams with all pharmaceutical functional areas, thereby gaining considerable practical industry knowledge. Additionally, he has 10 years’ experience working in clinical laboratories, including clinical microbiology. He has also been a military and college instructor. William has an undergraduate degree with a major in medical technology and a master’s degree in communications with emphases in technical writing and professional training and development. He has been a PMI (Project Management Institute) certified PMP (Project Management Professional) since 2007.